Nathan Solomon, the founder of Solomons, immigrated as a small boy, with his family to Australia from Russia around 1860. In 1890, after growing up in Sydney, he moved to Adelaide and opened a small general store and homewares business in Gouger Street. Carpets were added early on, and that little business in Adelaide, grew and grew. Nathan could never have imagined that Solomons would still be going strong 128 years later. Nathan’s youngest son, Myer, took over the business in 1940 and helped to grow the iconic Solomons brand that we all know and love today. Solomons has come a long way from our first store in Adelaide. From homewares to carpet to timber to new flooring like Luxury Vinyl Planks and laminates, we have a wide range of amazing flooring manufactured here in Australia and from around the world using modern techniques and materials. We also provide high quality blinds and shutters to help transform your home. 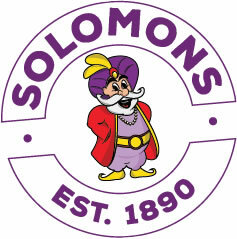 Solomons Flooring stores around Australia are owned and operated by local franchisees who take the business of providing outstanding quality flooring to Aussie homes very seriously. We are experts in what we do and being able to draw on over a hundred years of experience, means that our customers know that they are dealing with a company who knows their stuff. We take pride in the fact that we have grown from a little shopfront in Adelaide in 1890 to having stores in each capital city and many regional areas in this amazing country of ours. Now, that’s why, there really is magic in a Solomons floor.